1. You may cancel your booking up to 72hrs hours before arrival. (Does not apply to Groups) Please do so directly with the reception office. If you wish to cancel by email then please do so at least 7 full days prior to your arrival. 2. All group bookings must be paid in full 28 days prior to arrival, any changes or cancellations must be done before this time. Group Bookings balance will be automatically taken 28 days before arrival. 5. 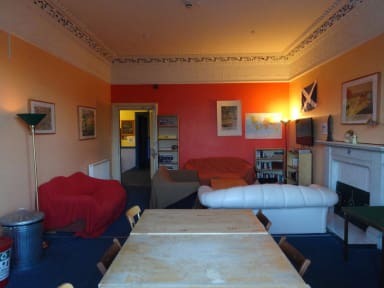 Your contract is with Hostels Scotland Ltd It is our responsibility to provide you with the accommodation. In the highly unlikely event of a problem arising, our liability to you, if any, is limited to the deposit and that reservation fee you paid. There will be a security deposit for room keys and sleep sheets. 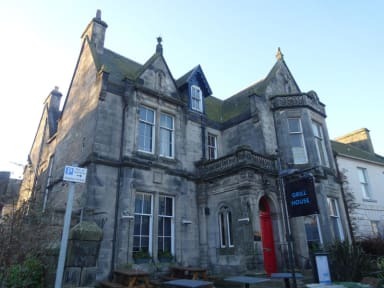 Located in the heart of the historic old town, our hostel has been given a 3 STAR RATING by SCOTTISH TOURIST BOARD. Five minutes from the bus station and all local attractions. Lively hostel with a cosy atmosphere and friendly staff who will advise you on bookings and travel arrangements. Newly fitted self catering kitchen, large lounge/dining room, with SATELLITE TV and DVD, free tea/coffee, wifi, and no curfew. Book a bed ahead service. Children and groups welcome - dorm room with 6/8 beds. Book early for summer months. Local attractions include St. Andrews Cathedral, Castle, St. Rules Tower, St. Marys House, Holy Trinity, Royal Golf Club and Sea Life Centre. Please be aware the hostel reception opening hours are 8am - 2pm , & 5pm - 10pm. U nfortunate,y we only spent one night here as my daughter did not like sharing a mixed room and being so young did not feel relaxed. No refund given either despite the Hostel being fully booked. Would prefer this if you had private rooms. Despite this, the people who stayed in our room were pleasant and no problem.except the Golfer left the room open on the.latch when he left in the early hours! Friendly, clean, central location. Also very quiet. Very comfortable. As hostels go, the best I have stayed in. Credit to the staff. Mark. Martin was a most helpful and gracious host. Thanks again!!! Great accommodations. Staff was friendly and relaxed, kitchen is clean and has everything you’ll need. Location is great and lounge is cozy. Unfortunately, upper bathroom could not be used but that was alright as it wasn’t too busy. All in all, great stay! All was great. Many restriction in the kitchen area (they let you know what you are not supposed to do). Overall it was really great, security is good (you get your password). Though the reception is not open 24/7 so we had to wait to check in. Friendly staff, good facilities, and excellent central location. Would come again! The location is prime in St. Andrews. Close to grocery, busses, and pharmacy. Staff are very helpful. Security can be improved: there is no safe place to store valuable items in the dorms. In my case I simply kept my valuables on me at all times, but nonetheless would have appreciated even a small lockable cubby. This is a nice place to stay and I would recommend to other backpackers. There're no lockers, so you have to carry your belongings with you at all times. (I've had any bad experiences, though). The bunkbeds are very shaky, and the blankets should be way warmer. Other than that the hostel is OK. Very dirty!!!!! The bedsheets were so worn out you could see through them all the yellow sweat patches on the matress which was caved in due to use. The pillows were also covered in sweat yellow patches! The room was extremely damp smelled of sweat and feet! The kitchen was dirty and the toilet on our floor didn’t work! Overall I wouldn’t recommend it and I definitely won’t be going back. The only good thing to say is that it does have a lot of potential as the location is ideal! No sense of professionalism from the staff. I asked "Do we need to show you our passports?" Check-in receptionist replies "I couldn't care less." Lighter in the kitchen doesn't work...staff member says "yeah i know. I'll let them know." you *are* them! The staff hung out in the common room. The hostel was dirty. Not worth your money. Go stay in Edinburgh and commute into St Andrews.